Scopa is one of the two national card games of Italy and is played using an Italian 40-card deck. While originally from Italy, Scopa and its variations have also gained widespread popularity in other countries, particularly Brazil. The word “Scopa” is Italian for “broom” and as the name suggests, a game of Scopa entails sweeping all the cards from the table. While mostly played between two players or two pairs of players, the game can also be played with an odd number of players such as 3 or 5. A game of Scopa involves skill to win but it also involves a fair amount of luck. Unlike more serious card games, a round of Scopa can be very lively and entertaining. Scopa remains to be very popular in Italy especially in the smaller towns where it’s easy to spot groups of people exchanging swear words in jest while caught up in an intense round of Scopa. A game of Scopa is traditionally played using a deck of Napoletane cards. Unlike the French 52-card deck common in the United States, the Italian deck is composed of only 40 cards. The deck is composed of four suits, which includes: Spades (Swords), Denari (Gold Coins), Coppe (Cups), and Bastoni (Clubs). Each suit has 7 symbol cards and 3 face cards, which include Fante (Knave), Cavallo (Knight), and Re (King). Each card has a numerical value in the game, which is represented by the number of symbols on the card (e.g. 4 swords is equivalent to 4). The face cards have numerical values as well: Fante is equivalent to 8, Cavallo is equivalent to 9, and Re is equivalent to 10. During a round of Scopa, players must gather around in a circle, with teammates seated across each other. One player is designated as the dealer and has to deal 3 cards to each player starting on the one to his right and continuing to deal counter-clockwise. The dealer must also place four cards facing up on the surface. The player seated to the dealer’s right must take the first turn. The player can either place a card on the table along with the four other table cards or try to capture other cards by playing a card that matches the numerical value of one or more cards on the table. The captured cards are then placed face down on a pile on the player’s side so the total value of the cards can be added later to determine the winner. A Scopa or “sweep” is achieved when one player manages to capture all the table cards on one turn. Once all the players have used the three cards, the dealer has to distribute new cards to each player starting with the person to his right. In this round, no more table cards are dealt and the player to the dealer’s right must begin the round again. This is done repeatedly until there are no more cards left to deal in the deck. Once the dealer has played his last card, the player who was able to perform the last capture is given the privilege of taking all the cards left on the table. Points are then calculated for each player or team and whoever scores the most wins the game. In the event that there is no winner, the player to the right of the dealer must reshuffle the cards and assume the role of dealer on the next round. 2. In the event that a card on the player’s hand has the ability to capture either 1 card or 2 or more cards, the player is allowed to only capture one card. For example, a player currently holds a 9 or a Cavallo and the table currently has another 9, a 6, a 2, and a 1, the player has no choice but to take the 9 even if 6, 2, and 1 added together makes a 9. Additional points are also awarded to the player or team who has captured the most number of cards, the player who has captured the greatest amount of coin cards, the player who has captured the 7 of coins, and the player who receives the highest number of points under the prime point system. Each award is given an additional point. The most common scoring system used for the prime are as follows: 7= 21 points, 6= 18 points, Ace= 16 points, 5=15 points, 4=14 points, 3=13 points, 2= 12points, and Re= 10 points. Since 7 is awarded the most number of points, players who capture the 7 of coins and the most 7s can easily win the prime award. In addition, players who have managed a Scopa or “Sweep” are also awarded extra points. It is worth noting, however, that additional points are only awarded at the end of the game and cannot be given in the middle of a round. The game is played until one player or team obtains 11 points or has more points than any of the other players or teams in the game. There are many card games based on the Italian card game Scopa. The French 52-card deck can also be used to play the game but 12 cards must be removed from the deck. So players using a 52-card deck can either remove all the face cards or remove the 10s, 9s, and 8s on the deck and replace them with the Jacks, Queens, and Kings. The diamonds are used as the coin deck so whoever captures the most diamonds is awarded extra points in the end. Perhaps one of the most popular variations of Scopa is a game called Scopone, which is heavily based off the original game. Scopone, however, has to be played by 4 players, divided into two teams. The same Italian 40-card deck is used with the same point system. Scopone essentially follows the same rules and scoring system as Scopa except that the number of players is strictly limited to 4. Scopone has two other well-known forms, Scopone Scientifico and Scopone Trentino. 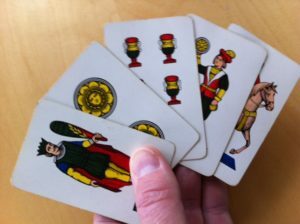 In Scopone Scientifico, 10 cards are given to each player and no cards are dealt on the table whereas in Scopone Trentino, the game continues until a team or player obtains 21 points. Another variation of the game Scopa is known as Scopa d’Assi. In this form, the Ace card has the ability to capture all the table cards. In some cases, if there is an Ace on the table, the player who plays an Ace can only capture the Ace on the table and not all the table cards. Rules vary per game so it is left up to the players to decide on a concrete set of rules before starting a round of Scopa d’Assi. While nothing quite beats playing Scopa using a traditional deck of cards, many digital versions of the game have been developed for those who want to play it on their computers and mobile devices. Both Pro and Lite versions of Italian Scopa are available on the Google Play Store and the Apple App Store. There are also many websites that offer playable online versions of the game. Popular online gaming site www.king.com offers an online version of the game on their website. A website called www.playscopa.com also offers an online version of the game where players can sign in using their Facebook accounts and challenge other players to a round of Scopa. Other websites include www.italiancardgames.com and www.gametwist.com. Napoletane cards or the Italian 40-card deck is available for purchase online. A deck costs around $7 to $10, depending on where you buy it. It is available for purchase in Amazon.com from a variety of sources. If you don’t want to buy a deck online, you can always visit a local card store or use a regular 52-card deck for Scopa. Scopa is a fairly simple game and it’s easy to understand the rules, which is perhaps why it has gained popularity all over the world. Scopa is both a game of luck and strategy. Since you can’t really pick out the cards that are dealt to you, you have to know how to play any card that is given to you to your advantage. Whether you’re a beginner or you just want to improve your game a little bit, there are some strategies that you can keep in mind to increase your chances of winning the game. When playing Scopa, it’s not just a matter of getting the most number of cards at any given time. It’s more about the value of the cards that you capture. Knowing when to give up three cards to capture one “coin” card is an important skill that you should master. Remember that coin cards are invaluable to winning Scopa. Another important tip is to always try to capture any card that an opponent has placed on the table, as it is usually part of a bigger strategy to earn more points. If you capture it before their next move, you lessen their chances of winning. You should also remember the categories for winning extra points in the end. As previously mentioned, Scopa is a game of strategy and luck but even in the unluckiest of situations, some players manage to win with the right strategies. Once you get the basic rules of the game, you’ll find it much easier to develop strategies for winning. The best way to learn and be good at Scopa is to keep playing it.